This pumpkin cake baked with almond flour yields a very moist cake. You can spread this with butter and even toast it if you fancy. I love the bright colour of it too. I find that pumpkin gives a dish a natural sweetness and the lovely bright orange colour too. Feel free to go crazy with adding more spices, as although pumpkin is sweet and moist, it does not have a very strong taste. So don’t feel too cautious about measuring out the spices. 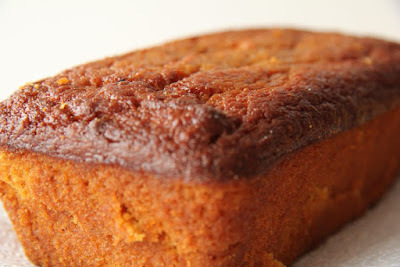 A moist low carb pumpkin cake recipe the whole family will enjoy. Preheat the oven to 150C/300 F degrees. Grease a 8×4′ inch loaf pan well. Beat in the eggs and then add the almond flour. Pour into the loaf pan and bake for 60 minutes until firm and a toothpick comes out clean. 0 Response to "Pumpkin Cake (Almond Flour)"